This Saturday, our family will be walking in the Down Syndrome Association of Northern Virginia's annual Buddy Walk. 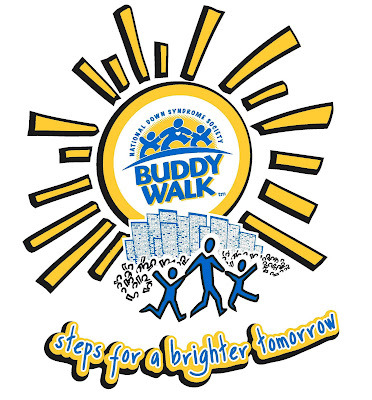 The Buddy Walk is an event to promote education and awareness for all people with Down syndrome ... obviously something that is very important to us. As you know, our two daughters are blessed with an extra chromosome. It is events like the Buddy Walk that help families like ours to raise our girls in the best way possible. As previously noted ... and most importantly ... it promotes education and awareness for our girls. It also helps to provide the financial assistance necessary for things like therapy, adaptive equipment (if needed), resources that we wouldn't otherwise have, among other things. We are asking for your support of our team, Two Girls Tribe! Every penny helps, so please consider supporting our girls or coming out to walk with us! Click here to make a donation. Thank you so much to everyone that has supported us ... we appreciate it more than words can say! Wish that we could be there!! !